Ever since the latest Apple Mac Pro was announced, it's been looked upon with a combination of lust and apprehension. The lust comes from the fact that the unit is a beast of a performer that should make any DAW fly like it's on steroids, but the apprehension comes from it's shape and the fact that the only connectivity is via USB or Thunderbolt. Those of us with legacy PCI cards are just out of luck. Or are we? Sonnet has introduced a new chassis called the xMac Pro Server that allows you to easily rack-mount the new "trash can" Mac Pro, provides 3 PCI slots for those legacy cards that you don't want to give up just yet, and has room for a variety of internal add-ons like hard drives, SSDs, or tape or optical drives. It even brings out all of the Mac Pro connections (Thunderbolt 2, USB 3.0, HDMI and Gigabit Ethernet) to the rear of the unit, plus supplies a handy Thunderbolt lockdown so you never have to worry about those important connectors accidentally slipping out. The unit retails for $1499 and is supposed to ship in June, right around the time when the next batch of Mac Pros ship. 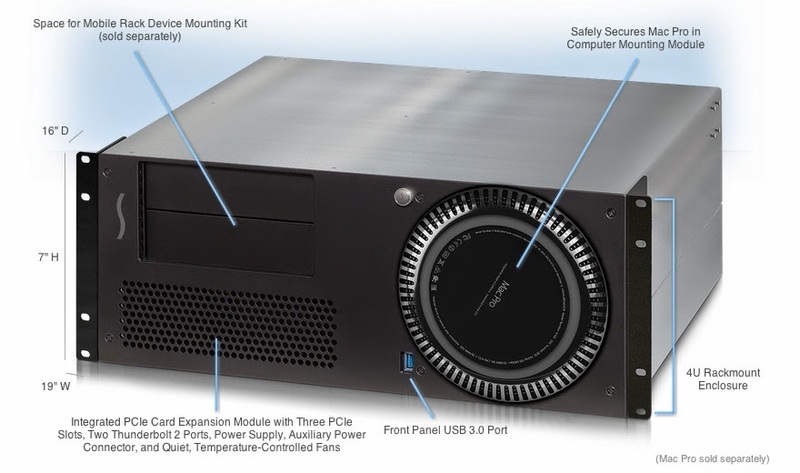 Sonnet has loads of tech information about the xMac Pro Server on their website. You have to go to around 2:50 in the following video to actually see the unit. Thanks to my buddy Biff Vincent for the heads up on this.